This Gothic Palazzo shelters a treasured national collection of Renaissance sculpture. Before its renovation to become Italy's first national museum, the building, constructed in 1255, functioned as a town hall, private residence and prison. It is one of the oldest buildings in Florence and has been the setting for some important episodes of civic history over the centuries, including sieges, fires and executions; the most famous being that of Baroncelli, who was executed for his involvement in a plot against the Medici, an execution witnessed by Leonardo da Vinci. An extensive collection of decorative art is on display, in addition to the magnificent sculptures of Michelangelo, Donatello, Giambologna and Cellini. The Palazzo's inner courtyard is ornamented with numerous coats of arms and the grand stairwell leading to the second-story loggia overflows with bronze birds created for the Medici's gardens. Other notable displays include an Islamic collection, an assortment of ivories (the largest collection in the world) and 16th-century majolica porcelain from Urbino, Faenza and Florence. 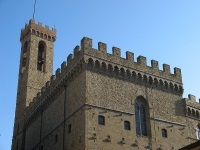 The Bargello is one of the most famous and popular museums in Florence and seldom fails to impress and awe visitors. Opening times: Open daily from 8:15am to 1:50pm. Closed on the first, third and fifth Monday of each month; closed on the second and fourth Sunday of each month; and closed on 1 January, 1 May and Christmas Day.